Witness the historic start of the final chapter in the Crisis trilogy that could only spring from the mind of Grant Morrison — Final Crisis, featuring stunning art by J.G. Jones! 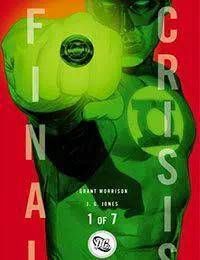 Worlds will live and heroes will die in this epic tale spanning the beginning and end of the DC Universe!<br />The entire Multiverse is threatened as the mysterious Libra assembles an army of the DCUs most terrifying super villains. But what is the ultimate plan, and who will live to find out?